Crystal Diamonds- Sundrop Crystal Gifts Even if you're not looking for a diamond shape for any particular purpose, try one! They have lots of Shine, Sparkle, & Rainbows! Enjoy! Diamond Double 76mm Generous three inch size! Beautiful in its simplicity, this crystal is simply a diamond within a diamond. Five big smooth facets to a side. The bright center facet matches the outside diamond shape. Appearance is similar to a nice thick beveled glass in an antique window or a stained glass creation. Or maybe it looks like an old fashioned happy and carefree kite! Perfect symmetry, smooth and sparkling. Very fine. Try one! $19.00 $16.99 On Sale! Diamond Slice Crystal! This crystal is a hanging parallelogram! Similar to our Smooth Slice, but instead of being cut diagonally from a cylinder, it is cut from a squared crystal sausage. Dramatic, shiny, interesting! The 80mm Size is three inches in length. Six sides, every one diamond shaped! Smooth diamond shaped facets front and back, and all smooth sides. Different and interesting! Angular and flattened, great geometric diamond shape! VERY bright and glittery! Great for contrast with rounded crystal shapes! Shines like crazy! A Very Pretty Swarovski Classic! $30.00 $25.99 On Sale! Radiant 50mm PURPLE Sorry- Sold Out Flattened and very angular, no curves anywhere. Well, maybe a few! Geometric diamond shape. VERY bright and glittery! Great for contrast with rounded shapes! This photo shows the NEW! Blue Violet (BV) Purple Color! The name exactly describes the color! If you like Purple, here's a great Purple crystal! Lovely Deep Purple! 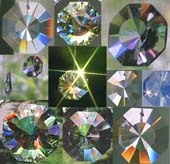 Genuine Swarovski Crystal $20.00 $17.99 On Sale! Bell ~ 50mm, 40mm, or 30mm Bell Crystal~ Beautiful and Interesting! The facets on this crystal love to make colors, as you can see in the photo! A chunky prism, packed with rugged rainbows. POPULAR! Three Fabulous Sizes! The Bell is not flat, but round as if it had been cut from a ball. Look at it from underneath, to see a fun pattern! Unique shape! The wonderful 50mm Size is a full two inches, with beautiful large, clear facets. VERY SHINY AND PRETTY. The great 40mm Size is about 1.5 inches long, and hefty and round. Lovely to look at! Bright and beautiful even in low light. The 30mm Size is a charming little thing, a VERY pretty little twinkler. Oddly shaped, beautifully faceted and shiny. About 1 1/8 inches, and round and chubby like a crystal ball. A clearly different, unusual shape to add variety to your collection. The Bell is a great, very lovely crystal. Display all three sizes together for a fun and interesting effect! Amazing how different they look in each size. ALL sizes are interesting and gorgeous! Try one today! Genuine Swarovski Crystal $35.00 $28.99 On Sale! Beautiful Big Swarovski Bell 50mm or Lovely Medium Size Swarovski Bell 40mm with Rainbow Beaded Hanger! Interesting Diamond Shape of the Crystal is echoed by the diamond shape of the deeply colored beads. A complete rainbow of Swarovski crystal beads in Red, Yellow, Green, Blue, and Violet is interspersed with small Crystal-ab beads to accent but not overpower the effect of the Rainbow. Colorful, Cheerful, and Beautiful! A wonderful Rainbow for any kind of weather! (Ornament Stand Not Included.) Genuine Swarovski Crystal with Handmade Bead Hanger $42.00 $38.99 On Sale! Bell ~ 50AB or 40AB Get Yours While Supplies Last! Bell Crystal~ Beautiful and Interesting! The gorgeous Crystal Bell with a touch of lovely AB added for you AB fans out there! Choose the Big 50mm (2 inches) Gorgeous Crystal Bell or the slightly smaller Nice Hefty 40mm (1.5 inches) size. Just a little bit of AB on a few of the facets to add that special sparkle and glow for the AB lovers! Very Pretty! Enjoy! Genuine Swarovski Crystal $36.00 $29.99 On Sale! Crystals are so much like Brilliant Diamonds! They gleam & flash with bright facets! They make rainbows & shimmering splashes of light! Find your favorite Diamond Shape for a special occasion or just for Fun! Celebrate a diamond birthday or anniversary, or anything calling for a 'Diamond' shape! Match the shape of your favorite ring, or your favorite fantasy diamond! We've made a collection of Diamond Shapes for you! Enjoy! Traditional Two Pointed Shape, Lots of Facets! Just Like A Marquise Cut Diamond! Traditional Pointed Oval Shape, Lots of Facets! Just Like A Pear Shaped Diamond! Similar to A Round Brilliant Cut Diamond! Always Ready to Stand in For A Diamond! Both available in FOUR sizes. Same Octagon Shape! Sundancer has beautiful extra facets! Shimmering Crystal! Beautiful Facets! LOADS of Rainbows! Very Round, Lots of Facets, Diamond Shaped Profile. Three Wonderful Sizes!